For years, the standard when it comes to open repair orders has been that as long as you get it closed and get an invoice to the customer, there is no harm and no foul. You got it closed and the customer has been billed. No big deal, right? Think again. It is a big deal. Rushing to close out repair orders under the wire, or “Turbo Close” should no longer be an acceptable standard. If you aren’t closing out repair orders in a timely manner, our research shows that you are costing your business money and creating unnecessary headaches. Most notably, if you are closing your repair orders in this fashion, you are severely depleting your margins. In our research, we have found that leaving a repair order open for just six days can cut both your parts and labor margins by four or five percentage points. Leaving them open for as long as 30 days can cut them by eight percentage points. 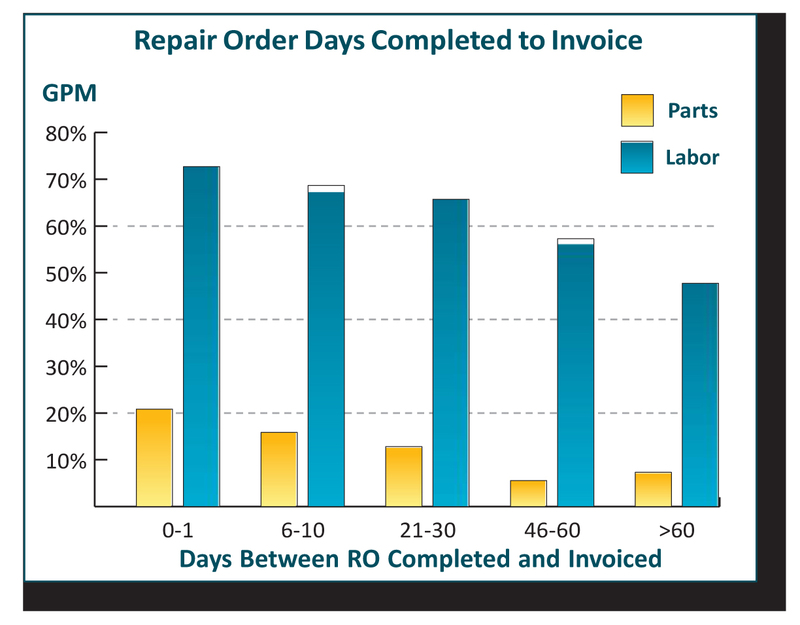 In the absolute worst of cases, repair orders left open for 60 days or more, your labor margins could be cut by as much as 35% and parts margins could be cut by as much as 65%. Many times, this occurs when an employee simply forgets exactly what happened on a given repair because the repair order has been sitting for so long. The “story” of how a repair came to cost what it did has to match up with how much you are billing the customer, but if you wait too long to make sure those two things match up, you might end up billing customers far less than they should be billed. Most people could probably tell you what happened on a particular repair order in the previous day or two, but if you wait much longer than that, that may no longer be the case. Think of it this way. You could probably tell me what you had for lunch yesterday, but unless you eat the same thing every day, you probably couldn’t tell me what you ate for lunch exactly three weeks ago. And that’s just lunch. Remembering what happened on a particular repair on a particular unit on a specific day is much, much more difficult. In short, there are no good reasons for declining margins, but forgetting what happened on a repair is a particularly preventable one. The evidence isn’t just anecdotal, either. In every business that we have studied, this has been the case. The graph at right gives a visual representation of the reduced margins that we have witnessed. If that’s not enough to make you reconsider the importance you place on closing repair orders quickly, consider how badly they can interrupt your cash flow. If you are waiting 15, 30, or 60 days to bill a customer, that’s just frozen capital waiting to be claimed simply because you haven’t closed out repair orders. That’s bad enough, but with the impacted margins you will be seeing at that point, it also won’t be nearly as much cash as you would have collected had you closed repair orders more quickly. That’s one heck of a double whammy. If you are a person that draws pay in part from the profit the shop brings in, this is a particularly tough pill to swallow, as that missed cash flow cuts right out of your profits. It’s also just good business to give your customers a chance to pay you as quickly as possible. The longer you wait to bill a customer, the less likely they are to turn around and pay you right away. Not only is it a pain to have to wait to collect cash that is rightfully yours, but if it goes on too long, you have to spend time tracking down customers that owe you money or pay a collection agency to do the work for you. But beyond that, “Turbo Close” just creates headaches in your shop. Each time you have to close out a bunch of repair orders that have been left open too long, stress levels go up in the shop, you end up having to pay overtime, and extra work has to be done that the shop sees no extra profit from. With all of this in mind, it is imperative that you create a culture in your shop that puts an emphasis on getting repair orders closed within 48 hours, before you start to see a precipitous drop in your margins. If you have to, create some sort of incentive within the shop for the person that does the best job of closing repairs orders on time. There’s a good chance that any sort of prize you give out would not cost you as much as you stand to lose if you don’t make a change in the standard for closing repair orders. “Turbo Close” became the industry standard because just getting it done was considered good enough. But it can’t be good enough anymore. The new standard is 48 hours. So the next time you are tempted to delay closing repair orders because you think there are more important things to be done or because you’re writing it off as a basic housekeeping task, think about whether or not you can afford to throw some money away for no reason at all. If the answer is no (and it should be), take the time to close your repair orders right then and there. It may be the easiest thing you can do right now to improve your profits.